It’s amazing to think that as long ago as the 17th Century Dr. Thomas Sydenham wrote that; “a man is as old as his artery.” It’s taken the best part of 300 years to prove that he was correct and yet even today arterial health is not as heavily ‘relied upon’ as other cardiovascular markers- for example cholesterol. Perhaps that’s because Arterial Stiffness Index (ASI) measurement has been difficult and expensive to undertake? But as you will discover in this article, that has all changed and for the first time ASI measurement has become very affordable and it can even be measured at home now!. Firstly perhaps we should remind ourselves of the importance of keeping our cardiovascular system healthy. It seems an obvious statement to make- that heart attacks kill. But that’s the point, often a heart attack can strike almost without warning, a few twinges in the left arm in the morning, some heart burning sensations in the afternoon and then a little later on- bam! A full blown infarction that leads either to the emergency room or the morgue! Compare that to cancer which typically ‘creeps up’ on a person taking time to ‘take hold’ and in theory at least gives a window of opportunity to have it treated. On that basis one could argue that it is even more important to take preventative measures to prevent a heart attack. Of course there has been a great deal of emphasis on healthy hearts over the last few decades and it does show in the death league tables as seen in Figure one: Selected causes of death and the start, middle and end of the last century. Cardiovascular diseases remains the biggest killer. UK Centre for National Statistics. 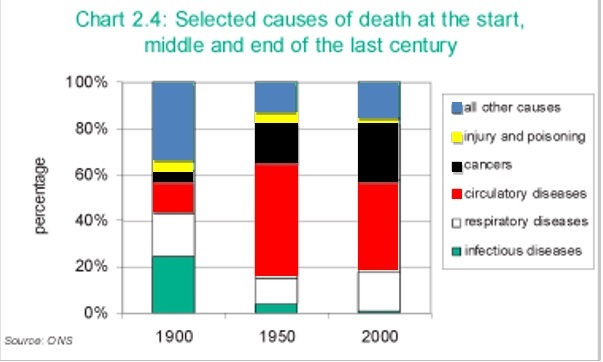 Figure one highlights that in the 1900’s most people died from infectious diseases and even respiratory diseases- heart attacks were a clear third, (note that cancer was fifth). Then in the 1950’s heart attacks were by far and away the biggest single cause of deaths and cancers were in a distant second place. But when we look at the 2000 figures, we see that despite all the adverts bombarding us with cholesterol lowering cereals and yogurts etc. and the strong emphasis that many physicians’ offices have had on cardiovascular disease, that dying from a heart attack still remains the biggest single killer (and now cancer is a close second). Another way of looking at this is to review the causes of death of people who die prematurely- which for this purpose we shall say that they die before the age of 75. The top of the leader board at 18% are the people who die because of a heart condition. Let’s put that another way, the general population under the age of 75 has nearly a 1 in 5 chance of dying from a heart attack. It soon becomes clear that this can be a complex picture, to attempt to assess the interplay between these various fats, inflammatory agents and deposits found in the blood. Monitoring and intervening with such an array of conditions must invariably mean mistakes or oversights, even at the best of doctors offices, leaving the patient exposed to potential issues. Are there any simpler approaches that can be taken? The Framington study is very famous in the research field because it comprises one of the largest studies ever undertaken over a long period, with more than 5000 adults being followed for more than three generations. This seems like a pretty obvious list, (that’s the public’s money at work for you!) and I would personally add environmental toxins to this list- their avoidance and their reduction (through detox and chelation methods). I’m a firm believe that we should know the basics by now and I suspect if you are reading this article that you are the kind of person that doesn’t have to be told twice, so what do we know beyond these lifestyle and diet choices? Just before we delve into the genuine ‘antiaging medicine’ part of this heart health article, let’s cover the subject of cholesterol since it is so firmly in the public’s eye. The basic rule of thumb is that HDL (high density lipoprotein) cholesterol is ‘good’ and LDL (low density lipoprotein) cholesterol is ‘bad.’ But according to Dr. Eric S. Rawson at the University of Massachusetts Medical School; “Cholesterol screening fails to identify 50% of the people who have heart attacks in the United States each year, because their total cholesterol is either normal or only moderately elevated.” So is cholesterol a friend or a foe? Of course nothing in life is ever that simple and if we had no cholesterol in our body we would be dead! Why? Because cholesterol is the base material (produced in the liver) that gets cleaved (methylated to be precise) by many dietary factors (B-vitamins etc) into all the hormones in our body (see figure two). 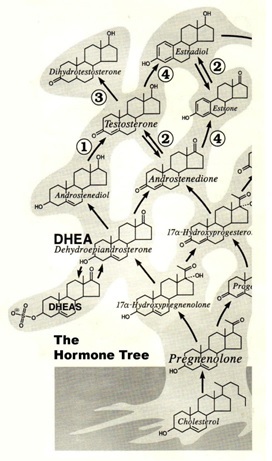 Figure two: The hormone tree: Cholesterol is at the base of all hormones in the body converted first into pregnenolone. Whilst this figure just shows a few of the initial examples fundamentally it highlights that cholesterol is at the root of this hormone tree. Thus, let’s pose our first question regarding ‘high’ cholesterol levels; are they high because the body is lacking its methylation agents to convert it into the necessary hormones it requires? Since the body cannot control its own intake of food and drink (and sunshine exposure), that’s your job- so to speak! The only way it can enable itself to make more of a required hormone is to produce more cholesterol. Pregnenolone is the first steroid precursor made from cholesterol. But in order to make pregnenolone, we need adequate amounts of LDL (bad?) cholesterol plus other nutrients, including vitamin A, thyroid hormones and enzymes. Pregnenolone is made inside the mitochondria and if any of these methylation materials are inadequate, then it could induce a hormonal deficiency. Consider then that the drug to lower cholesterol levels- statins- work by inhibiting the P450 enzyme to prevent initial cholesterol production from the liver. There are frequent reports of patients not having desired cholesterol lowering despite them using statins for long periods of time- is it because the body continues to try to make more cholesterol because it needs more hormones? By the way, it is an important to know that statins also inhibit CoQ10 (coenzyme Q10) in the body. CoQ10 is a critical energy molecule that is required in multiple processes- and in heart health too. Studies show that if you are using statins then the lower your cholesterol levels the lower your CoQ10 levels will be too. Some countries (like Sweden) insist on patients taking additional CoQ10 if they are using statins, some like Germany recommend it and others like the UK and US ignore it altogether! This is a disaster, if you are taking a statin we strongly recommend that you take additional CoQ10, at least 100mg to 200mg per day. Today there are also plenty of books on the market that highlight many of the side effects of statin drugs too, which include erectile dysfunction. One example would be ‘Lipitor, the thief of memory’ which highlights another frightening example, I say frightening because of the virtual abandon that statin drugs are prescribed. So we know cholesterol is an important part of producing our hormones, it also forms an important part of all cell membranes, but did you know that cholesterol is also a potent anti-oxidant? According to my good friend Rich Lippman Ph.D., cholesterol can actually neutralize one of the nastiest free radicals that can be produced in our body- the superoxide radical- and Dr. Lippman knows a thing or two because he was nominated for the Nobel Prize in medicine for his work in measuring free radical activity within the body. So I pose a second question regarding cholesterol- are high cholesterol levels due to the body wishing to neutralize superoxide free radical activity- probably due to another event? Let’s be clear- we are not advocating a cholesterol rich diet for antioxidant purposes! But simply pointing out that this may be one of the body’s defense mechanisms. But they are also the same factors as seen in Cushing’s disease patients, the only difference being that Cushing’s patients are recognised as having high cortisol levels! Cortisol has been referred to as the ‘dark hormone’ because it is responsible for stress levels and one of the few hormones that can increase in aging. We know that corticosteroids inhibit the immune system and they are used to shut down an overactive immune system in cases of autoimmune diseases such as rheumatoid arthritis, asthma, eczema etc. 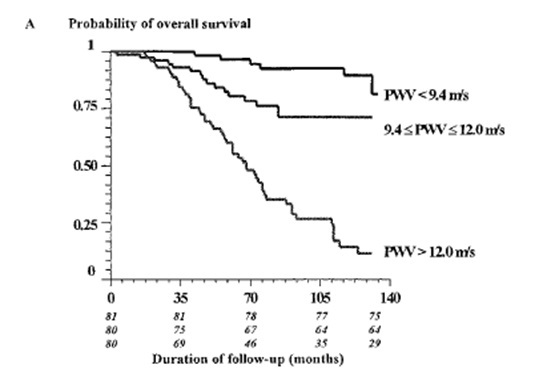 But long term use or abuse of steroids is known to result in the same abnormalities as seen in Cushing’s disease, i.e. high blood sugar and insulin levels, low HDL, high LDL, more blood clotting factors and increased visceral fat deposits. This has certainly been seen, even in young patients who have abused steroids for the purposes of body building for example. Another question then- is cortisol a more likely candidate as a cardiovascular marker than cholesterol? Whichever way you look at it, one conclusion can be drawn; cholesterol is not the be-all-and-end-all marker for cardiovascular health- indeed far from it. By the way if you need to lower your cortisol levels look to Gerovital, phenytoin or DHEA to help. Thus, if you keep ‘thin’ (low viscosity) blood and ‘soft’ arteries then your chances of a heart attack (or a stroke) are minimal. It makes sense on two important levels, thin blood and soft arteries mean that the heart doesn’t have to work as hard to pump around the blood and flexible arteries and thin blood are less likely to coagulate thus clots are less likely to form. Of course the first 5 steps are mirroring those found in the Framington study (mentioned earlier), but let’s look at the last two- perhaps the more interesting two. Take aspirin regularly- as a pharmacist I’ve never met a cardiologist to-date who wants to give direct dose advice, but we do know that 300 mg of aspirin releases about 2 ml of blood into the stomach, ergo aspirin is not a good long term alternative because it attacks the stomach lining, however a more typical short-term dose would be 75 mg. Personally I would recommend resveratrol instead of aspirin (more on that later). The last aspect of Dr. Kensey’s advice is to give blood regularly! Giving blood makes the body produces more clean cells helping to reduce its viscosity and probably also it helps to release/ remove toxins too. Regular menstruation has been cited as helping to clean out body toxins and excess iron but could it be that it also improves blood viscosity as a method to reduce the risk of heart attacks? Well according to the statistics from the American heart association twice as many men as women up to the age of 65 die of heart attacks. This is even more striking given that there are more women than men in the population aged over 35, however, guess what? Past the age of 65 women begin to catch men up and over 75 overtake men in terms of the number of heart attacks they have! Is the protection women are afforded under the age of 65 due to menstruation? I give my blood every 4 months and conversations I have with the nurses at the time suggest that there are very varied times of extraction from patient to patient- for the donation of 1-pint. As they keep these timed records, why not ask for yours to see where you stand and if you are changing? Obviously the longer it takes to extract your blood, (the system is gravity feed so should be the same ‘pressure’ each time) the thicker your blood is at the time. I suggest that this could be a simple method to keep an eye on your blood viscosity. Alas there was no advice in Dr. Kensey’s book about softening arteries, so I’d like to tell you about a trial that was conducted at IAS. I hope it sheds some light onto what is possible, but just beforehand let’s look at some evidence that having ‘soft’ arteries is favorable. Figure four shows that arterial stiffness is strongly correlated with life expectancy, in fact according to this published study there are vast differences between good-normal and poor arteries, with the harder the artery the worse the risk of having a fatal cardiovascular (or stroke) event. 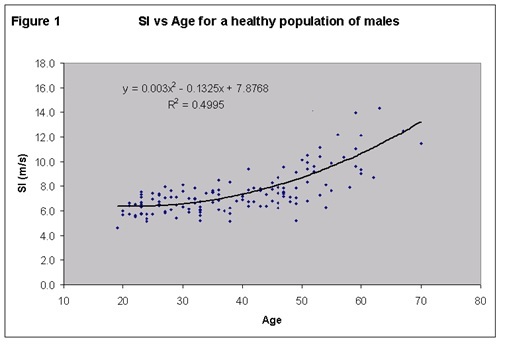 What’s more, arterial stiffness is known to be a good biological age marker; that is to say that in the average population arterial stiffness is expected to increase with age- this is shown in figure five. How can we measure arterial stiffness? There are several different methods, from hospital based invasive tests to computer linked clinician systems, but now there is a simple at home assessment device that also gives blood pressure and heart rate – the BioClip® Cuff. The to BioClip® Cuff uses the digital oscillometric system for measuring blood pressure and it was observed that there is a high correlation between the course of the cuff pressure drop from systolic to diastolic and the level of arterial stiffness (ASI). The to BioClip® Cuff software employs this data to provide eight levels of ASI that in turn show a close correlation to the hardening of arteries. These levels are presented on the to BioClip® Cuff screen as a traffic light system of 8 bars with the first 3 showing green for low ASI, the next 3 amber for medium ASI and bars 7 and 8 red for high ASI. The to BioClip® Cuff will record up to 30 reading and provide an average reading across them. It is important to remember that as with blood pressure so the ASI will vary during the day and be influenced by food or drink recently taken, exertion and short term stress such as running to an appointment having just drunk a cup of coffee. This is why it is the average that is important and not an individual reading. Although obviously if one has a high (red) reading one should think why this may be and rest for a few minutes before taking a second reading to confirm the first. If one’s readings are consistently high, 6, 7 or 8 lit bars one should consult a doctor. The to BioClip® Cuff also measures your blood pressure and heart rate, both of which along with the ASI reading are useful health indicators for you and your doctor. Stated in the journal of Medicine, Science, Sports & Exercise. Suzuki T, et al. Atorvastatin-induced changes in plasma coenzyme Q10 and brain natriuretic peptide in patients with coronary artery disease. Int Heart J. 2008;49:423–433. Got a query? Write to us.